This article is about trucks with passenger "containers". For buses that carry both passengers and goods, see Bruck (bus + truck). 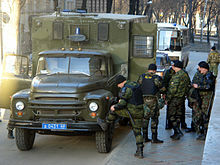 Tambov OMON units in Nizhny Novgorod with a "truck-bus" on a ZIL-130. 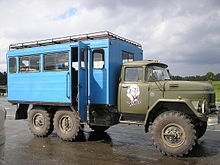 A combination bus, also called a truck bus or shift bus (Russian: вахтовый автобус, вахтовка, translit. vakhtovka) is a purpose-built truck with a "passenger container" fulfilling the role of a bus. Such vehicles used to be common in developing countries. Alternative combination buses can be a passenger/cargo module/container mounted on a truck chassis, or a bus with a large open or closed in cargo area known as a bruck. Truck buses were mainly used by the military, the police anti-riot units, public utilities, as school buses, and by state owned companies on short routes for employees. Combination buses are built by installing a complete box body equipped for transporting people onto a truck chassis. The body is independent and separate from the driver. There is usually no passage between the cab and box body but there is usually an intercom system. The body is equipped with windows, a separate internal lighting and heating and/or air conditioning systems. Related bodies are different types of mobile workshops or specialized military superstructure. Passenger comfort is generally minimal. Some companies such as Ha'argaz  manufacture combination buses by installing a partial bus body on an all-wheel-drive truck chassis. Due to the minimum of comfort provided by the combination bus, they are suitable for transport over short distances only. Specifically, the distribution of workers in large workplaces under the open sky such as a large construction site, agricultural labor, quarries or surface mines. Often these vehicles built on off-road vehicle chassis. These vehicles are also used as police intervention units, commandos and anti-terrorism units. Star 200 truck with passengers bodywork for the Milicja in Poland. Modern Tiyulit (Hebrew for "trip truck") in Israel used for transporting IDF soldiers in open non-paved terrain. NefAZ-4208/4951 shift bus based on a Kamaz 44108. Medium-sized Hino Songthaew (truck bus) as seen in Sakon Nakhon, Thailand. Wikimedia Commons has media related to Bus and truck combinations. This page was last edited on 26 December 2018, at 19:34 (UTC).